Simplification of the supply chain – great benefits for our customers – We have moved – Follow us on www.telestehub.com! Late in 2014 we started a simple project at our factory in Finland to create a weekly schedule for our shipping department, managed by our transportation specialist, Kerttu Pirttikoski-Munsin. We were facing a problem of uneven workload during the working week. On those days the weekly delivery schedule was not pre-defined and as a result we typically had a high peak of orders leaving on Thursdays whilst Monday and Tuesday were running on half the usual load. Additionally, we were expecting a significant increase in volumes and something needed to be done about the problem. Availability management for our customers: scheduled receipts always set to arrive on the same weekday helps in planning availability even if the planning system runs on weekly clock speed and granularity. Production planning: less hassle in our factory. Everyone knows the target date of the production, as all deliveries for certain customers need to be ready, e.g., on Wednesday to leave on Thursday. Optimal transportation capacity: cost savings and CO2 reduction through “carpooling”, as fewer trucks were driving half empty. We recently analyzed the results of the improvement of this process. They were brilliant – the results reached beyond our expectations regarding all of the above aims. 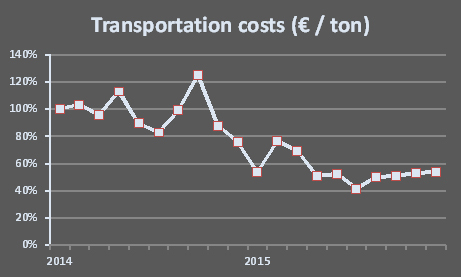 See the attached example graph from one of our market areas, where we have reached a 45% decrease in transportation costs in price / ton. I wanted to share these results as they highlight the overall goal of our LEAN program, which is to serve our customers more efficiently. Teleste has been working on a program to implement LEAN principles in our operations, logistics and sourcing. In this way, we are able to offer quality European products at a globally competitive price level, combined with world-class customisation capabilities and flexible delivery times.